I recently purchased the new thin bezel Dell XPS 13 Signature Edition from the Microsoft Store in Palo Alto. I like every aspect of this laptop from a technical standpoint, but I got unlucky and unfortunately received a defective unit. This time, the situation was different. 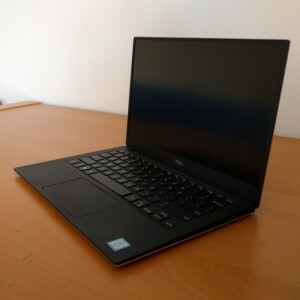 I've already done basic research online and had my mind set on the Dell XPS 13. The only bit I wanted to confirm in person was how the laptop weight felt in hand, how the keyboard typed, and how the keyboard was configured (sometimes, the Ctrl and Alt keys on the left are reversed, sometimes, the shift keys are very small, etc). Paying a visit to the Microsoft Store was the necessary experience required to seal the purchase of the Dell XPS 13. The staff at the Microsoft Store were only partly helpful. Unfortunately, the staff was unable to answer the only question I had regarding locking the Function Keys on this Dell Ultrabook. Not only were they not able to answer the question, but actually answered incorrectly and said it wasn't possible to lock the function keys. As soon as I left the store, I did a quick Google Search and found that it was possible. Unfortunately, I had already left the mall and did not get the opportunity to test out the Function Key lock. Purchasing directly from the Microsoft Store happened by chance that they had the best price when I was looking to purchase. But turns out having the Signature Edition was nice, as I didn't have to worry about bloatware preloaded on the laptop. This laptop is also available from Amazon. Function Button Lock - Ability to lock the Function Keys (F1 thru F12), which is important for programming IDE and for those who use Alt + F4 shortcut to close windows. Power Button Inside - Some computers have the power button on the side edges (next to the various ports), which causes inadvertent power on/off. One of the better and more accurate trackpads I've used on a Windows-based laptop. Two finger scrolling works well. Purchased without the touchscreen option, as I didn't find the touchscreen very useful on a previous laptop. Monitor flickering is the worst problem. It doesn't always occur, but happens at random intervals. Sometimes while watching YouTube videos, sometimes while browsing the internet, and sometimes while writing blog posts! Lastly, somewhat of a hardware problem is the magnetic flap that covers the Dell Service Tag magnetically takes the screw out with it. The screw located under the flap is completely stripped! Those are the only problems, and I've contacted Dell support to see what they can do to resolve the issue. Because there were issues, it's only right for me to outline how/if the issues were resolved. Calling Dell worked well, but turned out disastrous due to my lousy cell phone service. Right as I had fully explained the problems to the Dell customer service agent, the call dropped. He didn't take my cell phone number and didn't call me back. That's when I decided to turn to Dell Chat, hoping they could resolve technical issues. Turns out the chat worked out well. The interface was easy to use and because I had started the chat on a different computer, I could perform basic diagnostic tests. When I explained one of the physical problem of the stripped screw, I could upload an image so the customer service rep could see the exact problem. At the end of the day, the customer service rep sent me a pre-paid box for me to ship the laptop so they could replace the screw and solve all the other issues. It took a couple of business days for the empty box to arrive. And another week before the box got returned with the laptop. At the end of the day, all the issues were resolved and I'm fairly satisfied with the level of service.